FrogID is a national citizen science project that is helping us learn more about what is happening to Australia’s frogs. All around the country, people are recording frog calls with nothing more than a smartphone. Australian Museum’s Dr Jodi Rowley explains how FrogID can help save frogs – one of the most threatened groups of animals on the planet. Globally, we’ve already driven hundreds of frog species to extinction. Of Australia’s 240 known species, at least four have already disappeared. On top of that, other frog species haven’t been seen in decades and even more are perched on the edge of extinction. This is a terrible situation but all is not lost. Frogs have the ability to bounce back and we have the ability to turn things around for most of our frog species. But to do this, we need your help! Before I beg you to join Australia’s first national frog count, I think it’s important to know why we need to care about frogs. Frogs are among the first animals to respond to any kind of environmental change, such as pollution, climate change or habitat change. For this reason, frogs are often referred to as the “canary in the coal mine” and their disappearance is an early warning that something is wrong with the environment. In places where frogs disappear, whole ecosystems change irreversibly for the worse. Streams without tadpoles clog up with algae and the animals that rely on frogs for food begin to disappear. The loss of one frog species is more like losing two species, as adult frogs and tadpoles fulfil different roles in the environment. The loss of frogs also has a direct impact our wallet and our health. Frogs consume enormous amounts of insects, including pest species. Without frogs, we’d have a tougher job protecting our crops from pests. Healthy frog populations can keep mosquito numbers down, as tadpoles and mosquito larvae battle it out in ponds and swamps, thereby reducing your chance of contracting mosquito-borne diseases. Frogs also have a cocktail of chemical compounds on their skin that protect them from infection – and these compounds are being explored for their use in human medicine. So you may have a frog to thank for curing your next illness! It’s clear that we need to stop frog species from being lost to ensure the health of our environment and also our own health. But one of our biggest challenges in saving frogs is that we still don’t know enough about them. We don’t yet know how many frog species we have in Australia – three species of frog were discovered and named in Australia last year alone! Nor do we know where most of the known species are located, what kinds of habitat they need or whether they are healthy. This is where Australians come in. We urgently need everyone to take part in Australia’s first national frog count. The Australian Museum’s FrogID citizen science project will map the distribution of frogs across the continent, understand what habitats each species need, identify frog species that are doing well and those that are not, and come up with a plan to make sure we don’t lose any more frog species. FrogID takes advantage of the fact that each species of frog has a unique call. Some frogs chirp, others bark and others whistle. By recording these frog calls whenever you hear them with the FrogID app, you can identify the frogs around you and put them on the map. So please, join the fight to save the frogs of Australia. Download the FrogID app, get outside and record the calls of your local frogs. Who knows, you might even discover a new frog species! And all without having to get your feet wet! 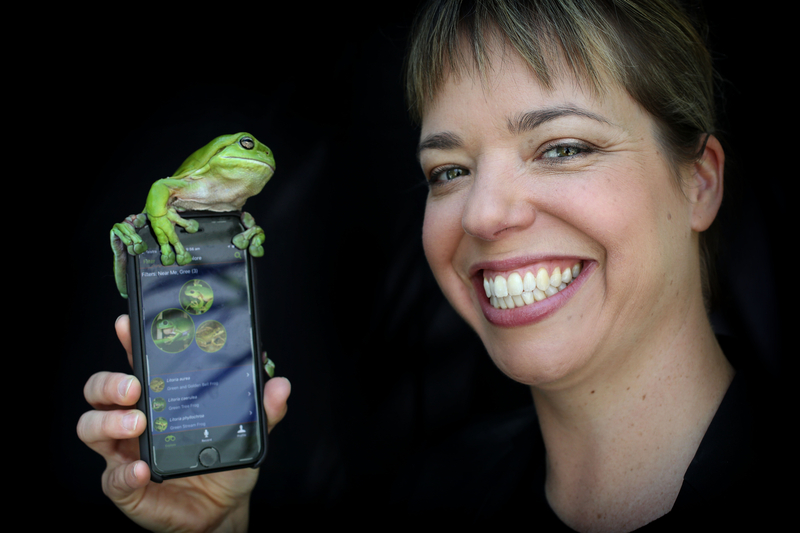 Learn more about FrogID, developed with support from Inspiring Australia and IBM. This guest post by Dr Jodi Rowley was first published by Fairfax Media. Dr Rowley is Curator of Amphibian & Reptile Conservation Biology at the Australian Museum and UNSW Sydney.